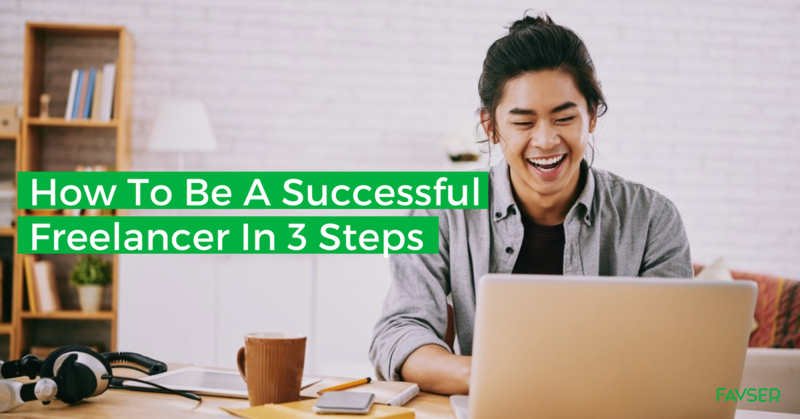 Be a Successful Freelancer In 3 Steps - In this age of connectivity enhanced with the establishment of online freelance platforms, it is never easier to be a freelancer. However, there is a distinct difference between being a freelancer and achieving success as one. If you are serious about achieving freelancing success and consider quitting your day job to freelance full-time, Favser has some tips for you to achieve that dream! Too often we focus on the difficult stuff without first building a solid foundation. Job-Specific Skills : This is pretty obvious-to be a freelancer in a specific field, you need to know what you are doing. Read up on the expected skills needed and brush up on them before being a freelancer. If you lack certain skills, fret not. There are multiple books and online learning platforms to learn new skills and brush up on old ones. Check out online learning platforms such as Udemy, edX and Coursera among many others! Communication Skills : As a freelancer, you will be working remotely most of the time. Communication skills are important to understand and deliver clients’ requirements. Some tips to enhance communication: if there are any questions or ambiguity regarding the tasks, do address them immediately. Keep in mind that the aim of communication is to convey and receive messages accurately. Be brief and specific-avoid writing long paragraphs with jargons. Problem Solving Skills : As with any occupation, problems are inevitable. When clients request for a change in direction or during unexpected emergencies, freelancers need to adapt and creatively solve problems. Anticipating problems will also alleviate some stress on your part, allowing you to keep calm and face problems head-on. Attention to Detail : Every step of the freelance process require attention to detail, whether it’s contacting a client or putting the finishing touches to your work. In fact, it may even cost you a freelance opportunity if you do not create an excellent first impression. Always double check before sending anything to clients, or risk being labelled as careless and unfocused. Time Management : Your schedule determines whether you will work at an appropriate pace or suffer from working overtime. Never agree to work before knowing the effort and hours it entails. Remember to allocate time for existing commitments and relaxation time. Discipline is also important-a schedule will not work if there is no effort to follow it. Financial Management : Similar to running your own business, at the end of the day you need to keep your finances in check. Learn basic business accounting or hire an accountant to perform bookkeeping tasks. Always remember to keep track of your income and expenses! As cheesy as it sounds, passion is the main ingredient for freelance success. Why? Passion cannot be faked. If you love something, you will naturally put in the necessary effort to excel. This extra push will distinguish you from other freelancers. With that said, having passion is not enough. It is important to let your passion show in everything you do. Facing a bleak month with no clients? Go out there and approach clients instead! Send enthusiastic cold emails offering your services and explain how your services will benefit the company. After securing a job, take initiative to go beyond and deliver an exceptional service. In no time, you will have clients that are more than happy to rehire you. Possess a growth mindset. Always seek to learn more about your field and upgrade your skills whenever the opportunity arises. Get updated with the latest industry news and stay relevant to your clients. Lastly, being persistent and having faith are important to continue hustling. Tough times are inevitable, but always remember why you started. Low on motivation? Read motivational quotes or books to keep going. As John Wooden puts it “Don't give up on your dreams, or your dreams will give up on you”. Keep going and you will soon find success knocking on your door! Favser wishes you all the best in your freelancing journey!